Fabian Sawatzki: It's you. You're him. Adolf Hitler: I never claimed to be anything else. History repeats itself. I guess it's my fate to have to part with my dearest companions. Fabian Sawatzki: Yes history repeats itself. You're fooling people with your propaganda. 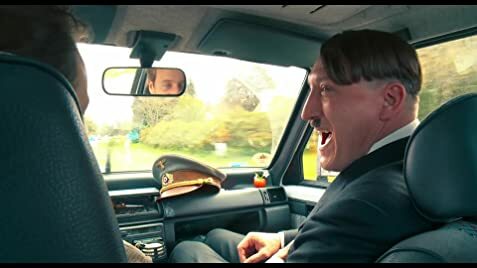 Adolf Hitler: Oh, Sawatski. In 1933, people were not fooled by propaganda. They elected a leader who openly disclosed his plans in great clarity. The Germans elected me. I like movies that make me think. 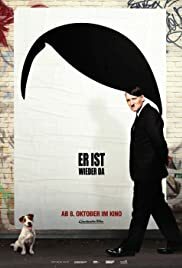 Er ist wieder da, was suggested to me as a comedy, and not being particularly fond of comedies, what I got was way more than expected. The movie treads a sensitive line with sufficient care, but what is most important to me, with plausibility. Even the few places where the script becomes "unreal", in general the coherence and treatment of the insertion of THE character in present society is preserved, and that is for me an enormous value in itself. The probing of current times by the use of this major historical character is remarkably able to become an exercise of philosophy and even introspection. In my opinion an extremely challenging script becomes here alive by his own merits, and the acting supports this substrate quite solidly. I laughed, and even if I today would better file it as a tragicomedy, For the sake of our times let's call it a comedy. And I very much hope, from the bottom of my heart that, in the next years to come we can continue to say, that it was so.